Crude oil is getting scarce. This is why researchers are seeking to substitute petroleum-based products – like plastics – with sustainable raw materials. Waste wood, divided into lignin and cellulose, could serve as a raw material. A pilot plant has been set up to handle this division on a larger scale. The pilot plant opened on October 2 as part of the new building constructed for the Fraunhofer Center for Chemical-Biotechnological Processes CBP in Leuna. We are still burning vast quantities of petroleum in our engines and heating systems today. Even the majority of synthetic materials are derived from the “black gold.” Yet this excess may soon be over. Certain industries that are heavily reliant on petroleum are consequently looking for alternatives. Thus, for instance, carbohydrates could replace the petroleum used to make plastics. But this choice also leads to moral conflicts – the “barrel of oil or bowl of food”-debate – because carbohydrates, such as starches and sugars, are foods. One option for obtaining carbohydrates is to use wood as a source, for example. It mainly consists of cellulose and hemicelluloses, in other words, carbohydrates and lignin. These substances were hitherto only procured in the production of cellulose (pulp) for wood-based paper production. But only 50 percent of the wood was a viable substance, the rest would be converted into energy, that is to say, burnt and thus consumed as bioenergy. In addition, lignin is contaminated, since sulfur compounds are typically used as a tool to break up the wood. So for many products, lignin is out of the question: it cannot be post-processed in systems that involve catalysts. So to make raw materials like wood accessible to certain sectors in the chemicals industry, researchers use the same approach as a biorefinery. Similar to a petroleum-based refinery, they fractionate the raw materials into their basic components, and then send each component to its optimal application. Researchers at the Fraunhofer Center for Chemical-Biotechnological Processes CBP, working jointly with 12 partners from industry and research institutions, recently developed a process that enables them to use 80 to 90 percent of the wood substance – moreover, the lignin is sulfur-free. “We break down the wood into its primary components, lignin and cellulose, by boiling it in water and alcohol at high temperatures and under high pressure – sort of like a pressure cooker,” explains Dr. Moritz Leschinsky, group manager at CBP. Lignin dissolves in the fluid, while the cellulose remains solid. In another step, the scientists extract the lignin from the fluid. 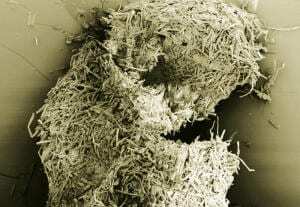 The extracted cellulose serves as a raw material for biosynthetics: Once broken down into basic components, i.e. sugars, the researchers then produce the necessary monomers from this. In turn, the lignin is used as a binding agent for the wood industry, for example, or likewise used as a biomaterial.